This contemporary and stylish reception solution offers fresh and exciting design with clean lines to add a touch of class to any reception area. This desk is made from high quality materials and has a Chestnut wood effect finish. The front panels of the desk are finished in a high gloss laminate that is available in a choice of Red, Orange, White and Lime Green. Not only is this desk fitted with an integral DDA compliant section, but there is also an under desk storage area that completes these desks. These desks also can be left or right handed depending on your reception plan. What does your reception area say about you? Do you think that your reception represents you well or that it seems a little out dated and worn. If you were a potential client that was making his/her first visit to your company then what do you think your opinion might be when you enter the reception area? If you think that perhaps your opinion might not be as positive as you would like, then our advice is that you should invest in a refurbishment of this area. Reception areas form a large part of the company and as this is the area that nearly all of the people that enter your office will walk through, it is very important that this area looks professional as it will help potential clients in particular choose whether or not, firstly if you are professional but secondly whether they want to work with you. There are many different types of reception area that you can choose to create, but making the reception area a true representation of your business can help to give the companies reception more of an association with the company. For example by just incorporating the company colours into the decor can help. You can also choose a more traditional or modern reception, depending on the type of industry you are in. 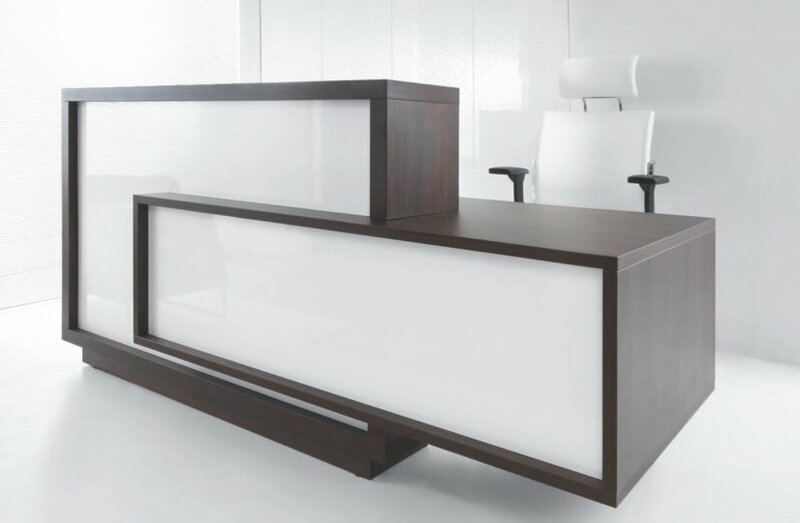 These Foro reception desks are single stand alone units that feature a high section with an integral DDA section built into the side. These reception desks can adapt as they can be used in a modern environment or, with the right colours can feature as a more retro desk. Delivery of these reception desks are free and they also feature a 5 year factory warranty. This desk will definitely be the centre piece to any reception are and has a unique and interesting shape. There is also options for the front panel and the DDA panel to contrast in colour as well as match. We at office reality offer a no obligation completely FREE design service where we will provide you with birds-eye and 3D visuals to help you realise your vision for your reception area. If you would like advantage of this completely FREE service then please call us on 01823 663 880.